I know some of us are wishing it was Friday, or even Saturday already. Although we aren't promised, we can hope for tomorrow. I'm sure many of you know what gardening means to me. It truly is one of my greatest passions. It really is such a wonderful and rewarding thing. To plant, to be one with the Earth and my God. But, we plant anyway. Why? Because, we believe! We believe that they will grow, and that tomorrow, and the tomorrow after that, we will see that growth and the changes. Eventually, after enough tomorrows, hopefully, we will see our glorious plants or flowers in their prime. Ready to harvest. Then, we will know that all that hoping was worth it. This quote can have such a deep meaning to some. For me, it really does mean Hope! It means that while God tells us, and we are often taught; Tomorrow is never promised. We still hope. It is our human nature. We can look forward. We can plan ahead. We prepare. Things may not turn out how we hoped, or planned. They may not happen at all, but we believe, we hope. Without the hope for tomorrow, there can be no joy in today. Do you plan a vacation to take with family? Do you apply for that big job? Do you take medication or a vitamin? Do you shop for a newer car that will last you years? Do you put away money for your child's future? Do you clean your home early, so that your weekend is free? 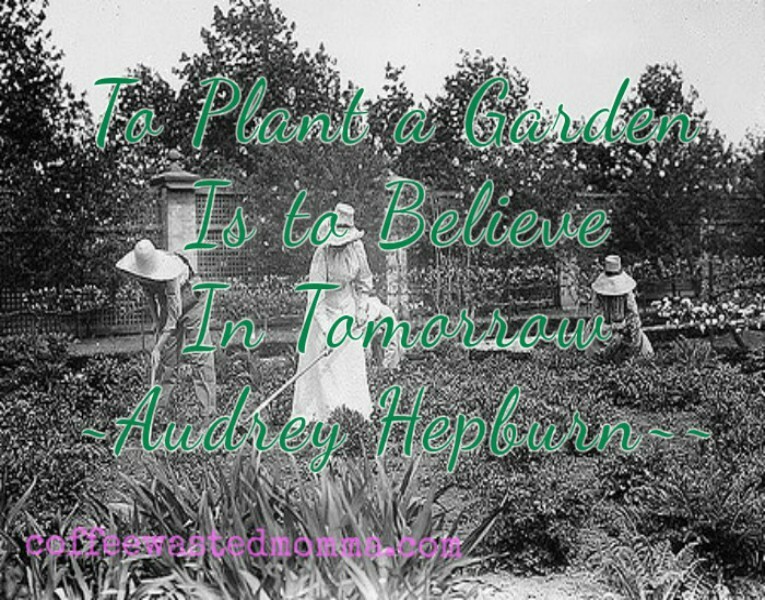 If so, you are planting your garden! What does "planting your garden" mean to you? 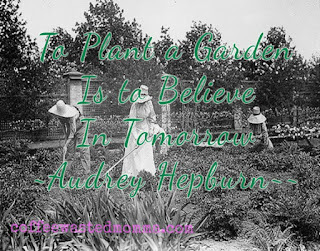 Labels: Audrey Hepburn, believe, gardening, hope, What's that quote?